THE FIFTH BEATLE TO FEATURE FOREWORDS BY BILLY J. KRAMER & ANDREW LOOG OLDHAM! AUGUST 20, TORONTO, ON—The anticipation around The Fifth Beatle continues to grow as Dark Horse announces the involvement of music legends Billy J. Kramer and Andrew Loog Oldham lending their words and support to this remarkable piece of graphic literature chronicling the life of Beatles’ manager, Brian Epstein. Billy J. Kramer was managed by Epstein in the 1960’s and had a string of hits including “Do You Want to Know a Secret?”, “Bad to Me”, and “Little Children”; and Andrew Loog Oldham was The Beatles’ publicist in 1963 before he went on to discover, produce and manage The Rolling Stones. Today, Kramer continues to record and release albums, and Oldham is a bestselling author and broadcast personality. More than merely the story of “The Man Who Made the Beatles,” The Fifth Beatle is an uplifting, tragic, and ultimately inspirational human story about the desire to leave behind a legacy, amidst the struggle to overcome crushing personal obstacles and insurmountable odds. 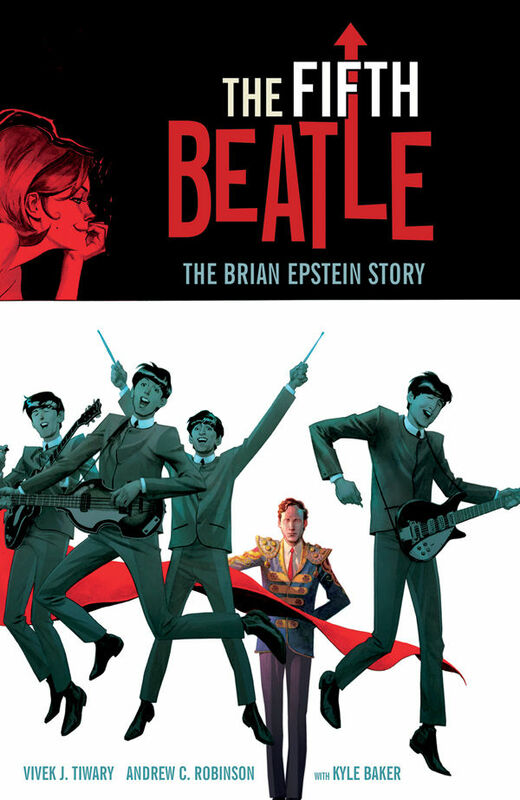 Written by multiple Tony Award–winning producer Vivek J. Tiwary (Green Day’s American Idiot, The Addams Family, Mel Brooks’ The Producers) and painted by fanboy favorite Andrew C. Robinson (Dusty Star, King Conan, Starman, Superman) The Fifth Beatle will be released on November 19. “Telling the Brian Epstein story in The Fifth Beatle has been a true labor-of-love, as I’ve long considered Epstein my “Historical Mentor” and someone I never had the good fortune to meet, but whose life story I have been greatly inspired by and have tried to learn from. So it is incredibly humbling and affirming to have the input and support of Andrew Loog Oldham and Billy J. Kramer, two music industry superstars who truly knew Brian Epstein. I’m extremely grateful to them both, and I can’t wait to share their illuminating contributions with our readers,” said Tiwary. The standard hardcover edition will be available for $19.99 in an oversized library format. Both a collector’s-edition and limited edition hardcover of this groundbreaking graphic novel will also be available, featuring a wraparound, textured cover and a section of bonus materials including Beatles and Brian Epstein memorabilia, artist sketches, and alternate covers, for $49.99 and $99.99. This entry was posted in Columns and tagged andrew loog oldham, billy j. kramer, dark horse, fanexpo, paul mccartney, the fifth beatle. Bookmark the permalink. Follow any comments here with the RSS feed for this post. Post a comment or leave a trackback: Trackback URL.